Scripture | ADULT CATECHESIS & CHRISTIAN RELIGIOUS LITERACY IN THE ROMAN CATHOLIC TRADITION: hosting ONLY True Christians!! !, or "How to think Catholic!!" 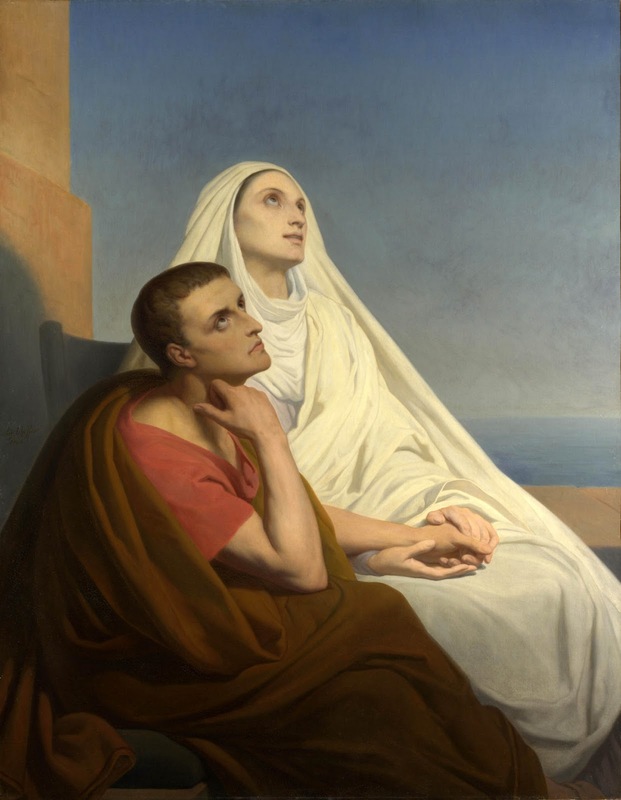 –Sts Monica & Augustine, by Ary Scheffer, (1846), please click on the image for greater detail. Today happens to be my late parents’ historical anniversary, and my late mother’s historical birthday. It has always been a special day in my family. Little did I know the Dominicans are required by their constitutions to remember deceased parents on this day. Praise Him!!!! A wise father once shared with me that the fourth commandment—honor thy father and mother—is a trump card he holds up his sleeve. He pulls it out when his children need to hear it. A stubborn teenager or a young adult know that Dad means business when the precept sounds. Sometimes the pater familias has to lay down the law for the good of the family. 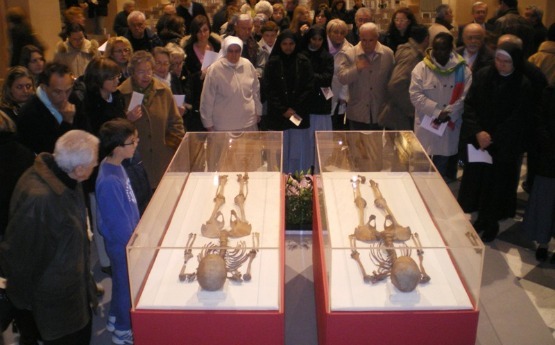 Mass of the Dead shall be celebrated in each convent on 7 February for the anniversary of fathers and mothers (LCO 70.II). St. Thomas teaches us that we can never repay our parents for everything they’ve done for us. They’ve given us life, nourishment, and instruction. In many ways, we wouldn’t be here if it weren’t for them. Existence, health, and (for many of us) the faith … our parents generously bestow all of these to us. Honoring our father and mother is an act of justice, but it is also an act of charity. More than just repaying a debt, fulfilling this commandment fosters gratitude for something we could never earn. The love that our parents have given us comes first, and we are called to respond. The parallel to the love of God is evident, and this is why the fourth commandment straddles between the commandments concerning love of neighbor and love of God. For those who have suffered the loss of a parent, a temptation can sink in that the time for the fourth no longer applies. Yet, this couldn’t be further from the truth, and there’s a more profound reason than mere obligation. Saint Augustine says that we are bound to love all, but cannot do good to all. Our limitations require us to perform acts of mercy in a selective way, and this begins with mom and dad. The filial bond we share with our parents orders our love, and death does not change that bond. Our love, thanks be to Jesus Christ, can pierce through the dark cloud of death. “Bury my body wherever you will, do not be concerned about that. One thing only I ask you [Augustine], that you remember me at the altar of the Lord.” (Confessions, 9.11.27). I have heard in my “travels” of the evangelistic kind, of adults converting to Catholicism by “reading their way into the Church”. Hence, this blog. All is grace. “Saint Chrysanthus is one of the many who have experienced how useful and beneficial is the reading of devout books, especially the Gospel. He was born of heathen parents. Polemius his father, stood so high with the emperor, that he was raised to the dignity of a Senator. Chrysanthus’ greatest pleasure was reading; and one day, by special Providence, the Gospel fell into his hands. He read it through most attentively; but not being able to comprehend it, he secretly requested a Christian to explain it to him. This Christian procured him an opportunity to speak to Carpophorus, a holy and very learned priest, who explained to him all he desired to know, and, with the divine assistance, succeeded so well, that Chrysanthus recognized the falsity of the heathen gods, as well as the truth of the Christian religion, and having been properly instructed, he received holy baptism. After this, he appeared no more at the heathen theatres and sacrifices, but associated with Christians, which awakened in his father the suspicion that his son either desired to adopt the faith of Christ, or perhaps was already enrolled among the number of the faithful. He called him to account, and as Chrysanthus fearlessly confessed the truth, the angry father cast him into a damp and dark prison, determined to let him die there of hunger. As, however, after a few days, he found him as strong as ever, and as firm in confessing Christ as he had been before, he resorted to other and more horrible means to compel him to forsake Christ. He confined him in a room most luxuriously fitted up, and sent several wicked young women to tempt him, believing that this would be the easiest manner of bringing him back to idolatry. When the first of these women entered, and the chaste Chrysanthus became aware of her intention, he cried loudly to God for assistance, most solemnly declaring that he would much rather die than offend Him. He endeavored to flee, but the room was locked. Hence he did all that was possible under the circumstances. He turned his face away, shut his eyes and closed his ears with both hands, while he continued to pray to the mighty God for assistance. His prayers went to heaven; for the woman was suddenly seized with so invincible a drowsiness, that she sank to the floor, and was carried out of the room. The same happened to the second and the third; and the Saint, recognizing the hand of the Almighty in it, gave due thanks to heaven. Polemius, however, ascribed it all to witchcraft, and sought in another manner to compass his design. He persuaded Daria, a virgin consecrated to the service of Minerva, to marry his son, in order to draw him gradually away from the Christian faith and bring him back to the gods. Daria consented, and Polemius bringing her to Chrysanthus, introduced her as his future spouse. 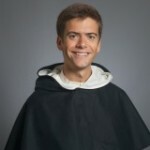 Chrysanthus, conversing for some time alone with her, told her that he was a Christian, and making her acquainted with the reasons which had induced him to become converted, he succeeded, by the grace of God, in making her promise to embrace the true faith. Not satisfied with this, he explained to her how priceless a treasure chastity is, adding that he was determined to preserve it unspotted. He also said to her that he was willing to marry her, to give her the opportunity of becoming a Christian, but only if she was willing that they should live in perpetual continence. Daria consented cheerfully, after which Chrysanthus announced to his father that he was ready to make Daria his wife. Polemius, greatly rejoiced, ordered a splendid wedding, after which the newly-married couple lived as they had agreed upon, in virginal chastity. Soon after, Daria was secretly baptized, and endeavored to lead an edifying life with her spouse. Both assisted, to the best of their ability, the oppressed Christians, and also used every opportunity to bring the infidels to the knowledge of the true God. For a time they were not molested; but when, at length, Celerinus, the Governor, was informed of their conduct; he gave Claudius, the Praetor, orders to investigate the matter. Hence, Chrysanthus was brought into the Temple of Jupiter to sacrifice to the idols, after the manner of the pagans. As he refused to do this, he was scourged so dreadfully, that he doubtless would have died, had not God preserved him by a miracle. After this, he was dragged, laden with heavy chains, into a dark hole, into which all the sewers of the prison emptied. Being locked up in this foul place, the holy man called on the Almighty, and suddenly the darkness around him gave away to a heavenly light; a delicious odor filled the air, and he was freed from his heavy chains. Claudius, in consequence of this and other miracles, desired to be baptized, with his wife, Hilaria, his two sons, Maurus and Jason, and seventy soldiers who were under his command. The emperor was greatly enraged when this news was reported to him, and ordered Claudius drowned, Hilaria hanged, and Maurus and Jason beheaded. Meanwhile, Daria also was imprisoned on account of her belief in the Christian faith. She evinced, however, no less fortitude than her holy spouse. She was taken into a house of ill-repute to be a prey to wicked men. Daria, in this danger, called on the great protector of the innocent, and God caused a lion to break from his place of confinement and come running to her, as if to guard her from all harm. When the first man entered the room where the chaste virgin was, the lion seized him, threw him to the ground, and then looked up to Daria, as if to ask her whether he should kill him or not. The tender martyr helped the trembling youth to rise, and reproaching him for his wickedness, she exhorted him to do penance, and succeeded in persuading him to become a Christian. The same happened to two others, who, like the first, left her converted. The tyrant raged when he heard of it, and commanded fire to be set to the room in which Daria was, that she might be burnt with the lion. When the fire was kindled, Daria made the sign of the holy cross over her protector, the lion, and sent him away through the flames uninjured. She herself also remained unharmed, though the room was burnt to ashes. Many other miracles were wrought by her and by Saint Chrysanthus, in consequence of which a great many heathens were converted. At last, both were sentenced to be thrown into a deep sand pit outside the city, near the Via Salaria Nova where, covered with stones and sand, they were buried alive, in the year 283 AD. Saint Chrysanthus shut his eyes and closed his ears with both hands, that he might not see nor hear those who had been sent to tempt him. Oh! how wisely he acted! Numberless persons have fallen into vice and have been precipitated into hell, because they did not guard their eyes from gazing on dangerous persons and objects; or because they listened to flatteries or to impure words and songs. Death came upon them through eyes and ears, like a thief through the window. If they had turned their eyes away and closed their ears, if they had left those who spoke immodestly and sang lascivious songs, they would not have become guilty of sin, and would not have been cast into the depth of hell. The pious king David would not have fallen, if he had not been careless in the use of his eyes. 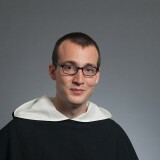 And where would he be, if he had not done penance? The beginning of the misfortunes which assailed the strong Samson, and which ended in his death, was his gazing upon Delilah. Sichem, a noble prince, was tempted to sin, as we are told in Holy Writ, by looking upon the imprudent Dina, and being soon after murdered, was cast into hell. We omit innumerable others whose ruin began in the same manner. Each of these shall cry out, during all eternity: “My eye,” (my ear) “has wasted my soul” (Lament iii.). Imprudent looking about and listening robbed them of their innocence, their piety, the grace and friendship of God, and at last, of salvation. If you do not wish to experience the same, keep your eyes, your ears, and in fact all your senses under control. “Hedge in thy ears with thorns,” admonishes the Wise Man, “hear not a wicked tongue.” (Eccl., xxviii.) 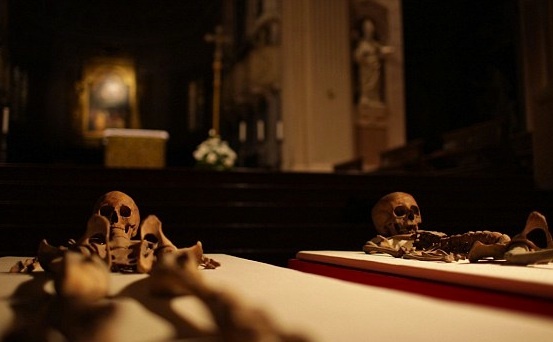 “Those who listen voluntarily to sinful speeches, give death permission to enter through the window,” writes Saint Theodore. “The eyes are the leaders of sin,” says Saint Jerome. “To preserve purity of heart, it is necessary to keep a guard over our exterior senses,” says Saint Gregory. 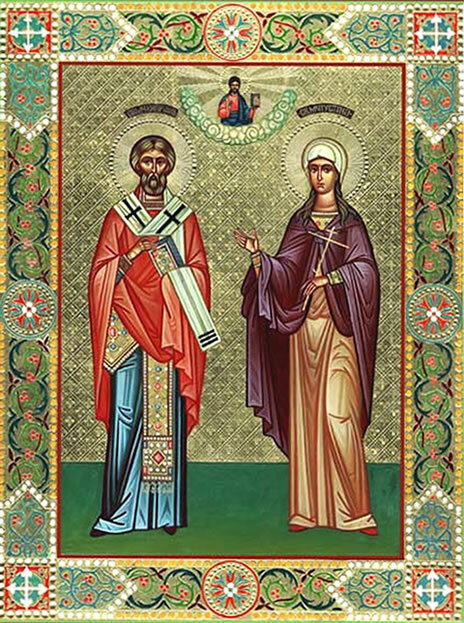 Saint Chrysanthus and Saint Daria were thrown into the greatest danger to sin. They were tempted, but without their fault. They resisted, called on God, and did all in their power not to yield, and God protected them from consenting to do wrong. As these Saints were subjected to exterior temptations, so are many souls tempted interiorly; some through their own fault, others without the reproach of the slightest guilt. To the former belong those who spend their time in idleness; who are intemperate in eating and drinking; who neglect prayer and other good works; who, without reason, seek dangerous company, assist at indecent plays, read unchaste or sensational books; who look at persons immodestly dressed or at unclean pictures; who like to listen to, or indulge in improper jests, or songs; who play indecent games; delight in wanton dances and amusements; make friends and acquaintances of persons of little or no virtue; in short, those who in their manners and actions, dispense with Christian modesty. 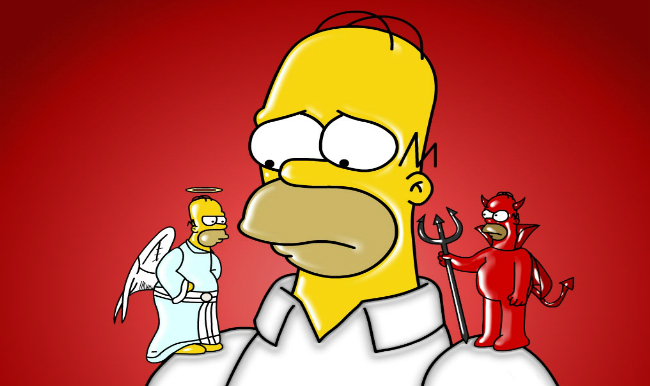 All these can blame only themselves when they suffer from unclean temptations; they themselves give occasion to them. But there are many who, though they avoid all this, are still violently tempted, as was the case with many Saints in this world. These are not to be blamed for their temptations, as they have not, by their conduct, occasioned them. The former have every reason to fear that they will commit great sins in consequence of the temptations which they themselves have caused; for it is written: “He that loveth the danger, shall perish in it.” (Eccl., iii.) No one will believe such people when they say that they are sorry to be troubled by such temptations. If this is the truth, why then do they give occasion to them? To imagine that these temptations can easily be overcome, without the divine assistance, is presumption; for, God has nowhere promised His aid to those who throw themselves into danger. They are not worthy of it. What else then, can they expect but that they will frequently fall into sin, and finally into hell? Quite differently must those be judged who are tempted without their own fault. If they do all they can, and pray to God for help, they will not be overcome, but may be assured that the Almighty will assist them, as they manifest their love and fidelity to Him by avoiding everything that may lead them into temptation. And who can believe that God will forsake His faithful servants in their fight? In 2008 the Reggio Emilia Cathedral in Modena in Northern Italy faced renovations. 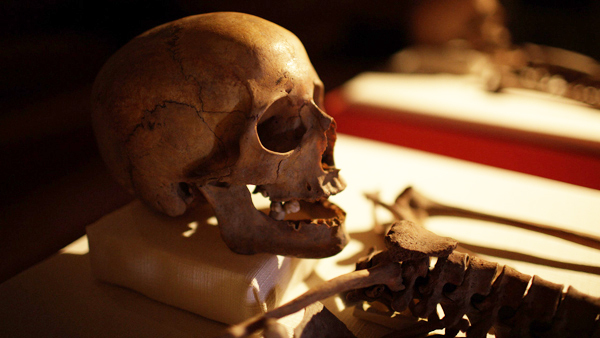 The workers discovered more than 300 bones belonging to two skeletons in one of the sealed crypts. 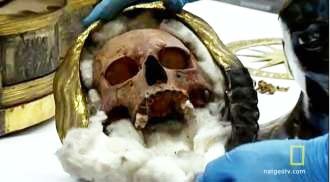 The skulls were packed inside a pair of silver-and-gold busts deep in a cathedral vault. 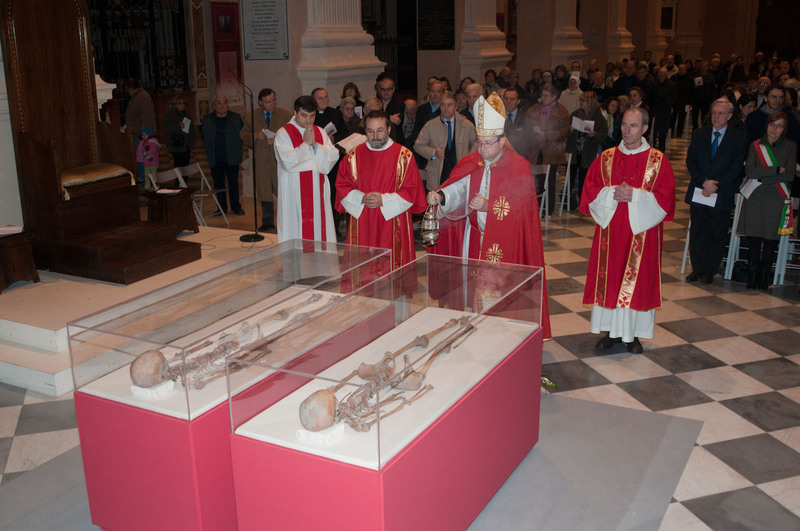 The relics of Daria & Chrysanthus were venerated and displayed. Carbon dating showed they belonged to a young man and a young woman in their late teens with a radiocarbon date between AD 80 and AD 340. 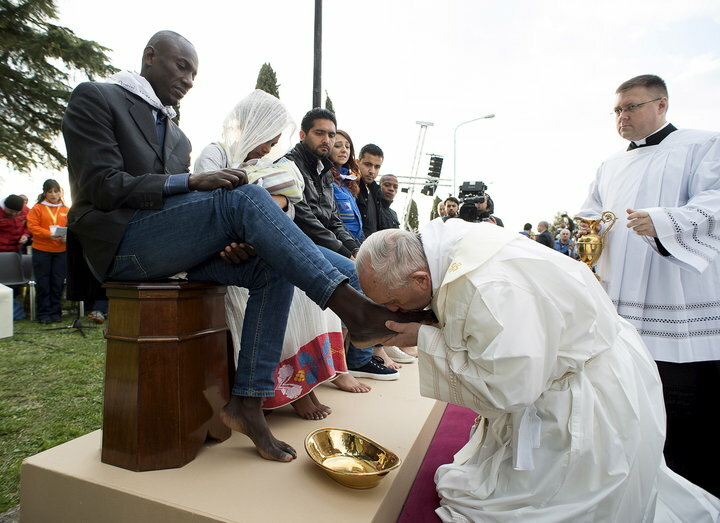 -Pope Francis kisses the feet of Muslim refugees during the foot-washing ritual at the Castelnuovo di Porto refugees center near Rome, Italy, March 24, 2016. 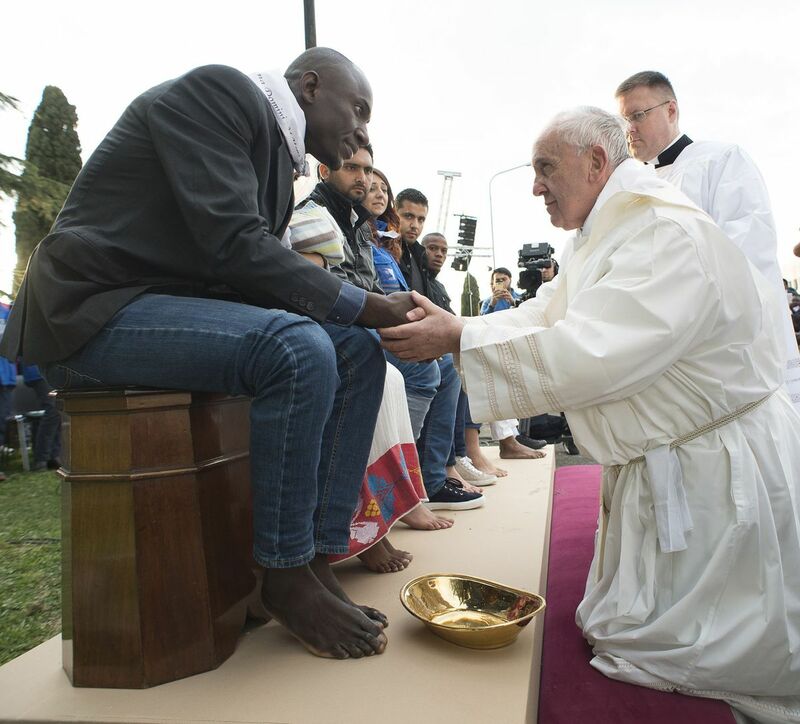 Pope Francis on Thursday washed and kissed the feet of refugees, including three Muslim men, and condemned arms makers as partly responsible for Islamist militant attacks that killed at least 31 people in Brussels. Presence of God – Make me understand, O Lord, that the surest sign of my love for You is a sincere love for my neighbor. A soul who lives for God sometimes needs to be reassured that its love for Him is not an illusion. What criterion will give it the greatest certitude? St. Teresa of Jesus says, “We cannot be sure if we are loving God, although we may have good reason to believe that we are, but we can know quite well if we are loving our neighbor. And be certain that, the farther advanced you find you are in this, the greater the love you will have for God” (Interior Castle V, 3). This is an indisputable argument because the virtue of charity is but one; and while it is difficult to verify our love for God, it is impossible to deceive ourselves about our love for our neighbor. We have no need of any great insight to know whether we are charitable, patient, forgiving, and kind to others, and precisely from the way we behave toward them can we deduce the measure of our love for God. Sometimes we can deceive ourselves thinking we love God very much because we experience certain spiritual joys during the time of prayer. We believe that we are ready to confront any sacrifice for the love of God because we feel ardent desires arising within us. St. Teresa of Avila, with keen psychological insight, warns souls of the pitfalls into which they may fall and puts them on their guard: “No, sisters, no; what the Lord desires is works. If you see a sick sister to whom you can give some help, never be affected by the fear that your devotion will suffer, but take pity on her: if she is in pain, you should feel pain too; if necessary, fast so that she may have your food, not so much for her sake as because you know it to be your Lord’s will” (Interior Castle V, 3). This is real love, and it was exactly in this sense that St. John the Evangelist said in his first epistle, “We know that we have passed from death to life, because we love the brethren” (1 John 3:14). He did not say, because we love God, but because we love the brethren, for fraternal charity is the most certain sign of true love for God. “O Lord, the surest sign of my love for You is the degree of perfection with which I keep the commandment of charity toward my neighbor. As this is most important, I must strive to know myself better, even in the very smallest matters, taking no notice of all the fine plans that come crowding into my mind when I am at prayer, and which I think I will carry out and put into practice for the good of my neighbor, in the hope of saving even one soul. If my later actions are not in harmony with these plans, I can have no reason for believing that I should ever have put them into practice. Nor should I, my God, imagine that I have attained to union with You, and love You very much, because of the devotion and spiritual delights which I may have had in prayer. I ought rather to ask You to grant me this perfect love for my neighbor and then allow You to work. If on my side I use my best endeavors and strive after this love in every way I can, doing violence to my own will so that the will of others may be done in everything, even foregoing my own rights; if I forget my own good in my concern for theirs, however much my nature may rebel; if I try to shoulder some trial, should the opportunity present itself, in order to relieve my neighbor of it, You certainly will give me even more than I can desire. But I must not suppose that it will cost me nothing. Besides, Lord, did not the love You had for us cost You, too? To redeem us from death, You died such a grievous death as the death of the Cross” (Teresa of Jesus, Interior Castle V, 3). “To me, this always has been the root question, the answer to which answers most other questions in religion. Who—or what—is the (Christian) authority? 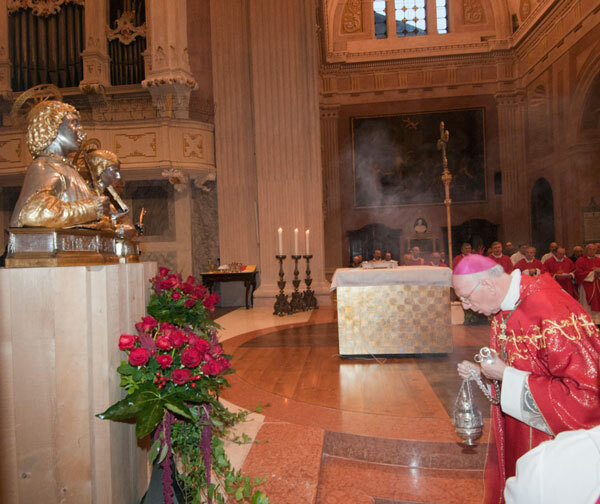 Is it a living Church, endowed with a magisterium guaranteed, in some way, to hand on faithfully the deposit of faith and capable of deciding fresh questions in a definitive way, or is it the individual Christian, relying on what appears to him/her to be the perspicuity of Scripture? The claim that the Bible is the final authority reduces to the claim that its reader is the final authority. This perhaps can be appreciated best when discussing infallibility. 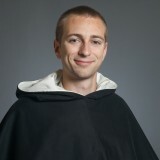 The Catholic position is that the Church itself is infallible and that its infallibility may be manifested in one of three ways: by formal decrees of ecumenical councils, by highly-circumscribed decisions of popes making definitions on their own, and by the centuries-long, consistent teaching of the Church. (Ed. It DOES NOT MEAN Popes, or the lesser, are not sinners!!! Pssst…the Church is FULL of SINNERS!!!! That is its raison d’ etre!!! Mk 2:17, Lk 5:31-32, Mt 9:12. I look at infallibility as I look at my father when I was a child calling a definitive halt to debate in our house. The reason being the debate was becoming more destructive than resolution would have been beneficial, if possible, which it was not looking like by the time he called a halt, imho.) Protestant churches have no equivalent of the magisterium, even those that have structures that formalistically mirror those of the Catholic Church, such as an episcopacy and councils. If these churches admit infallibility, that charism, by the end of the discussion, is found always and only in Scripture itself. Proponents says that it is the Bible that is infallible. That is a misuse of the word. The Bible is inerrant—that is, its teaching, when properly understood, contains no error. This is a necessary consequence of the inspiration of Scripture: God could not inspire a sacred writer to propose as true what in fact is false. But inerrancy is not infallibility. Inerrancy is a static thing. 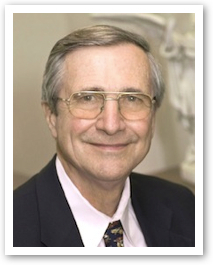 It is a testament that both testaments are accurate in conveying the truths they attempt to convey…Inerrancy is a good and, for the economy of salvation, a necessary thing—the Bible would not be of much utility if it were awash in errors—but inerrancy is not infallibility. Infallibility is the inability, under certain circumstances, of deciding or defining in error. Infallibility means not being able to make a mistake. Its existence suggests the possibility, under other circumstances, of a wrong decision being made. It is this second status that all of us are familiar with, since we make wrong decisions regularly. It is the very making of wrong decisions that lets us imagine that it might be possible to have a situation in which making wrong decisions is not possible. -Keating, Karl. 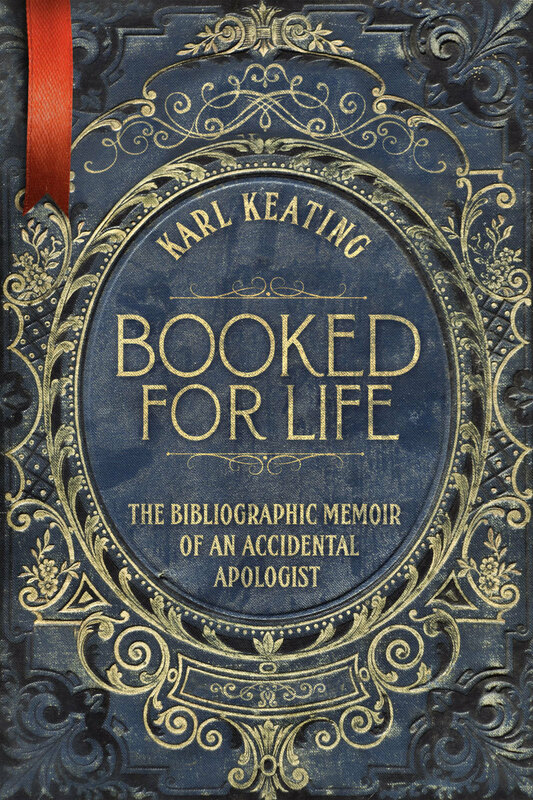 Booked for Life: The Bibliographic Memoir of an Accidental Apologist (Kindle Locations 2276-2299, 2309-2310, 2312-2319). Catholic Answers Press. Kindle Edition. 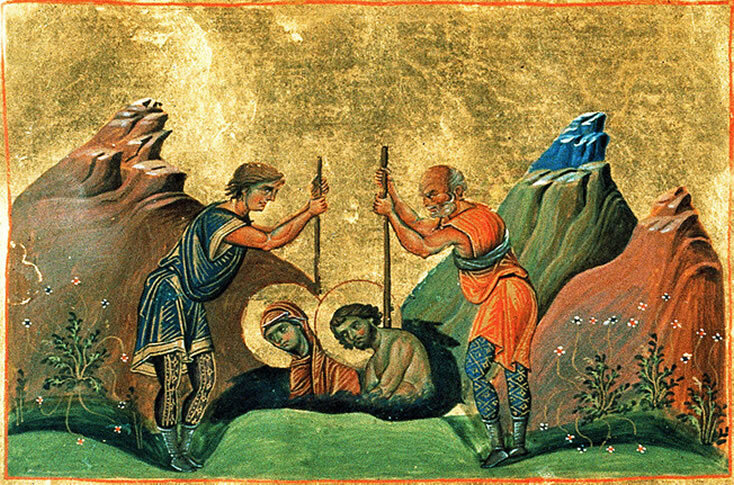 …Peter is an example of (this) second kind: Struck by the Lord’s gaze, he bursts into healing tears that plow up the soil of his soul. He begins anew and is himself renewed. Then I heard Him call out in a loud voice, “Bring near those who are appointed to execute judgment on the city, each with a weapon in his hand.” 2 And I saw six men coming from the direction of the upper gate, which faces north, each with a deadly weapon in his hand. With them was a man clothed in linen who had a writing kit at his side. 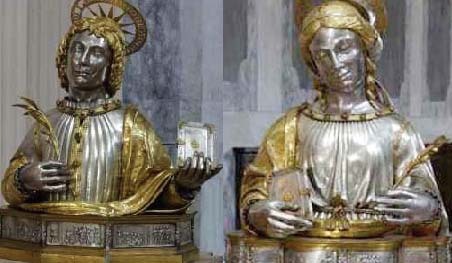 They came in and stood beside the bronze altar. Ezekiel 9:4 offers us a striking testimony to how this positive kind of mourning can counteract the dominion of evil. Six men are charged with executing divine punishment on Jerusalem—on the land that is filled with bloodshed, on the city that is full of wickedness (cf. Ezek 9:9). Before they do, however, a man clothed in linen must trace the Hebrew letter tau (like the sign of the Cross) on the foreheads of all those “who sigh and groan over all the abominations that are committed in the city” (Ezek 9:4). Those who bear this mark are exempted from the punishment. They are people who do not run with the pack, who refuse to collude with the injustice that has become endemic, but who suffer under it instead. Even though it is not in their power to change the overall situation, they still counter the dominion of evil through the passive resistance of their suffering—through the mourning that sets bounds to the power of evil. …Once again, as in the vision of Ezekiel, we encounter here the small band of people who remain true in a world full of cruelty and cynicism or else with fearful conformity. They cannot avert the disaster, but by “suffering with” the one condemned (by their com-passion in the etymological sense) they place themselves on his side, and by their “loving with” they are on the side of God, Who is love. …Those who do not harden their hearts to the pain and need of others, who do not give evil entry to their souls, but suffer under its power and so acknowledge the truth of God—they are the ones who open the windows of the world to let the light in. It is to those who mourn in this sense that great consolation is promised. The second Beatitude is thus intimately connected with the eighth: “Blessed are those who are persecuted for righteousness’ sake, for theirs is the kingdom of heaven” (Mt 5:10). Ratzinger, Joseph. 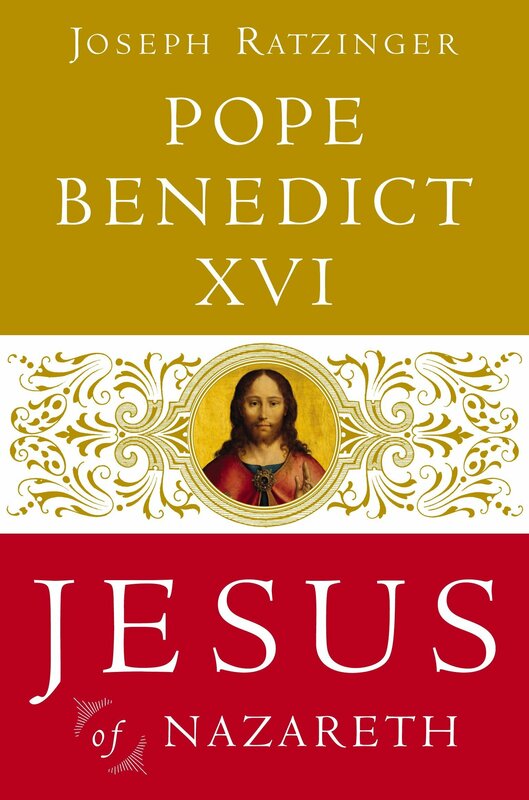 Jesus of Nazareth: From the Baptism in the Jordan to the Transfiguration (Kindle Locations 1418-1429, 1430-1433, 1436-1445). The Crown Publishing Group. Kindle Edition. “While our human judgment suffers from a deep fallibility, God’s judgment is subject to no such imperfection. Throughout the Sacred Scriptures, God asks His prophets to go and report to people that He will judge them. Jonah goes to the Ninevites. Elijah tells king Ahab that “the dogs shall lick up [his] blood” for his crimes (1 Kgs 21:19). John the Baptist demands that the Jewish people repent for their sins. These are not instances of fallible human judgment. Rather, God uses human agents to proclaim to His people the reality of His judgment, in order to try to convince the wayward to change. Divine judgment is coming. 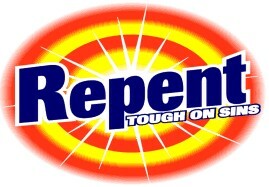 Now is the time for repentance. Jesus, too, demands repentance, but He makes an explicit promise. “The kingdom of God is at hand. Repent, and believe the Gospel” (Mk 1:15). The kingdom of God, expanded upon by Jesus in so many parables throughout the Gospels (the pearl of great price, mustard seed, treasure hidden in a field), is the promise of a life governed by God, ordered by God, healed by God—a life with God. It is that which makes our earthly lives worth living as they become mysteriously entwined with eternity. Presence of God – O Jesus, increase within me Your love and Your zeal for the glory of the Father; teach me to despise all personal glory and to flee from it. “Jesus ever sought His Father’s glory, and to this end He chose for Himself utter humiliation, even to becoming “the reproach of men and the outcast of the people” (cf Psalm 22:7). Bethlehem, Nazareth, Calvary—the three great stages of the humble, hidden life of Jesus, in which He veiled His glory as the Son of God. Even during His public life, when His divinity was more openly manifested, Jesus tried to flee as much as possible from human glory. Many times after performing a miracle, He imposed silence on those who had witnessed it. He forbade the three Apostles who had been present at the Transfiguration “to tell any man what things they had seen, till the Son of Man shall be risen again from the dead” (Mark 9:8). After the first multiplication of the loaves, “when He knew that they would come to take Him by force and make Him king [He] fled again into the mountain Himself alone” (John 6:15). 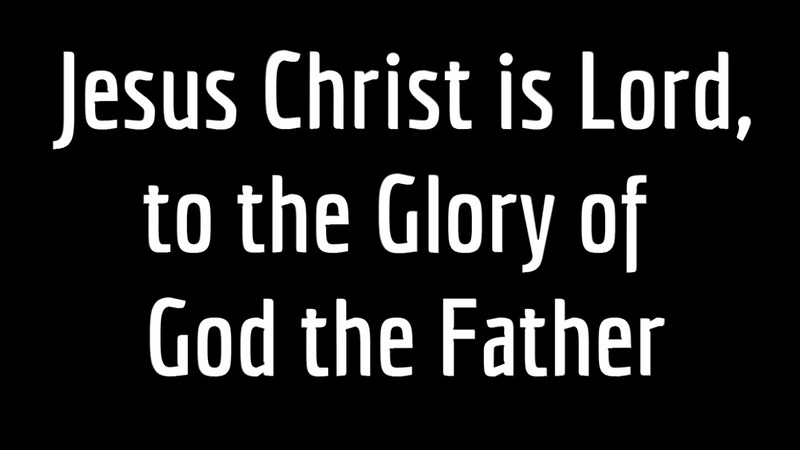 The glory of Jesus lies in the fact that He is the Son of God; He desires no other glory. It is as though He would relinquish this essential glory by accepting any other. Therefore He said: “If I glorify Myself, My glory is nothing; it is My Father that glorifieth Me” (John 8:54). Jesus knows that after His death He will be glorified and acknowledged as the Son of God and the Savior of the world, but He desires that even this glory may be for the glorification of His Father: “Father, the hour is come, glorify Thy Son, that Thy Son may glorify Thee” (John 17:1). O Lord, give me Your love for Your Father’s glory, so that I too, wretched and poor though I am, may serve my God in some small way and give Him glory. “May it be Your pleasure, my God, that the time may come when I shall be able to pay at least a small part of the immense debt I owe You; do You ordain it, Lord, according to Your pleasure, that I may in some way serve You. There have been others who have done heroic deeds for love of You; I myself am capable of words only; and therefore, my God, it is not Your good pleasure to test me by actions. All my will to serve You amounts to nothing but words and desires, and even here I have no freedom, for it is always possible that I may fail altogether. Strengthen and prepare my soul, Good of all good, my Jesus, and then ordain means whereby I may do something for You, for no one could bear to receive as much as I have and pay nothing in return. Cost what it may, Lord, permit me not to come into Your presence with such empty hands, since a man’s reward must be according to his works! O Lord, here is my life, my honor, and my will! I have given it all to You; I am Yours; dispose of me according to Your desire. Well do I know, Lord, how little I am capable of, but keep me near You. I shall be able to do all things, provided You do not withdraw from me. If You should withdraw, for however short a time, I should go where I have already been—namely, to hell” (Teresa of Jesus, Life, 21). Make me understand, O Lord, that if I wish to work for Your glory and the glory of Your Father, I must be entirely detached from every desire for personal glory; otherwise I shall deceive myself, thinking that I am working for You, whereas in reality I am but serving my own ego. “The argument from conscience, Romans 2: 14-16, is one of the only two arguments for the existence of God alluded to in Scripture, the other being the argument from design, Romans 1:18-20. Both arguments are essentially simple natural intuitions. Only when complex, artificial objections are made do these arguments begin to take on a complex appearance. The simple, intuitive point of the argument from conscience is that everyone in the world knows, deep down, that he is absolutely obligated to be and do good, and this absolute obligation could come only from God. Thus everyone knows God, however obscurely, by this moral intuition, which we usually call conscience. Conscience is the voice of God in the soul. Like all arguments for the existence of God, this one proves only a small part of what we know God to be by divine revelation. But this part is significantly more than the arguments from nature reveal about God because this argument has richer data, a richer starting point. Here we have inside information, so to speak: the very will of God speaking, however obscurely and whisperingly, however poorly heard, admitted, and heeded, in the depths of our souls. The arguments from nature begin with data that are like an author’s books; the argument from conscience begins with data that are more like talking with the author directly, live. The only possible source of absolute authority is an absolutely perfect will. Before beginning, we should define and clarify the key term conscience. The modern meaning tends to indicate a mere feeling that I did something wrong or am about to do something wrong. The traditional meaning in Catholic theology is the knowledge of what is right and wrong: intellect applied to morality. The meaning of conscience in the argument is knowledge and not just a feeling; but it is intuitive knowledge rather than rational or analytical knowledge, and it is first of all the knowledge that I must always do right and never wrong, the knowledge of my absolute obligation to goodness, all goodness: justice and charity and virtue and holiness; only in the second place is it the knowledge of which things are right and which things are wrong. This second-place knowledge is a knowledge of moral facts, while the first-place knowledge is a knowledge of my personal moral obligation, a knowledge of the moral law itself and its binding authority over my life. That knowledge forms the basis for the argument from conscience. If anyone claims he simply does not have that knowledge, if anyone says he simply doesn’t see it, then the argument will not work for him. The question remains, however, whether he honestly doesn’t see it and really has no conscience (or a radically defective conscience) or whether he is repressing the knowledge he really has. Divine revelation (Ed. through Scripture) tells us that he is repressing the knowledge (Rom 1:18b; 2:15). In that case, what is needed before the rational, philosophical argument is some honest introspection to see the data. The data, conscience, is like a bag of gold buried in my backyard. If someone tells me it is there and that this proves some rich man buried it, I must first dig and find the treasure before I can infer anything more about the cause of the treasure’s existence. Before conscience can prove God to anyone, that person must admit the presence of the treasure of conscience in the backyard of his soul. Nearly everyone will admit the premise, though. They will often explain it differently, interpret it differently, insist it has nothing to do with God. But that is exactly what the argument tries to show: that once you admit the premise of the authority of conscience, you must admit the conclusion of God. How does that work? Conscience has an absolute authority over me. Nearly everyone will admit not only the existence of conscience but also its authority. In this age of rebellion against and doubt about nearly every authority, in this age in which the very word authority has changed from a word of respect to a word of scorn, one authority remains: an individual’s conscience. Almost no one will say that one ought to sin against one’s conscience, disobey one’s conscience. Disobey the church, the state, parents, authority figures, but do not disobey your conscience. Thus people usually admit, though not usually in these words, the absolute moral authority and binding obligation of conscience. Such people are usually surprised and pleased to find out that Saint Thomas Aquinas, of all people, agrees with them to such an extent that he says if a Catholic comes to believe the Church is in error in some essential, officially defined doctrine, it is a mortal sin against conscience, a sin of hypocrisy, for him to remain in the Church and call himself a Catholic, but only a venial sin against knowledge for him to leave the Church in honest but partly culpable error. So one of the two premises of the argument is established: conscience has an absolute authority over me. The second premise is that the only possible source of absolute authority is an absolutely perfect will, a divine being. The conclusion follows that such a Being exists. something higher than the human level but not yet divine. In other words, we cover all the possibilities by looking at the abstract, the concrete-less-than-human, the concrete-human, and the concrete-more-than-human. The first possibility, #1, means that the basis of conscience is a law without a lawgiver. We are obligated absolutely to an abstract ideal, a pattern of behavior. The question then comes up, where does this pattern exist? If it does not exist anywhere, how can a real person be under the authority of something unreal? How can more be subject to “less”? If, however, this pattern or idea exists in the minds of people, then what authority do they have to impose this idea of theirs on me? If the idea is only an idea, it has no personal will behind it; if it is only someone’s idea, it has only that someone behind it. In neither case do we have a sufficient basis for absolute, infallible, no-exceptions authority. But we already admitted that conscience has that authority, that no one should ever disobey his conscience. The second possibility, #2, means that we trace conscience to a biological instinct. “We must love one another or die”, writes the poet W. H. Auden. We unconsciously know this, says the believer in this second possibility, just as animals unconsciously know that unless they behave in certain ways the species will not survive. That’s why animal mothers sacrifice for their children, and that’s a sufficient explanation for human altruism too. It’s the herd instinct. The problem with that explanation is that it, like the first, does not account for the absoluteness of conscience’s authority. We believe we ought to disobey an instinct—any instinct—on some occasions. But we do not believe we ought ever to disobey our conscience. You should usually obey instincts like mother love, but not if it means keeping your son back from risking his life to save his country in a just and necessary defensive war, or if it means injustice and lack of charity to other mothers’ sons. There is no instinct that should always be obeyed. The instincts are like the keys on a piano (the illustration comes from C. S. Lewis); the moral law is like sheet music. Different notes are right at different times. Furthermore, instinct fails to account not only for what we ought to do but also for what we do do. We don’t always follow instinct. Sometimes we follow the weaker instinct, as when we go to the aid of a victim even though we fear for our own safety. The herd instinct here is weaker than the instinct for self-preservation, but our conscience, like sheet music, tells us to play the weak note here rather than the strong one. Honest introspection will reveal to anyone that conscience is not an instinct. When the alarm wakes you up early and you realize that you promised to help your friend this morning, your instincts pull you back to bed, but something quite different from your instincts tells you you should get out. Even if you feel two instincts pulling you (e.g., you are both hungry and tired), the conflict between those two instincts is quite different, and can be felt and known to be quite different, from the conflict between conscience and either or both of the instincts. Quite simply, conscience tells you that you ought to do or not do something, while instincts simply drive you to do or not do something. Instincts make something attractive or repulsive to your appetites, but conscience makes something obligatory to your choice, no matter how your appetites feel about it. Most people will admit this piece of obvious introspective data if they are honest. If they try to wriggle out of the argument at this point, leave them alone with the question, and if they are honest, they will confront the data when they are alone. The fourth possibility, #4, remains, that the source of conscience’s authority is something above me but not God. What could this be? Society is not above me, nor is instinct. An ideal? That is the first possibility we discussed. It looks as though there are simply no candidates in this area. And that leaves us with God. Not just some sort of God, but the moral God of the Bible, the God at least of Judaism. Among all the ancient peoples, the Jews were the only ones who identified their God with the source of moral obligation. The gods of the pagans demanded ritual worship, inspired fear, designed the universe, or ruled over the events in human life, but none of them ever gave a Ten Commandments or said, “Be ye holy for I the Lord your God am holy.” The Jews saw the origin of nature and the origin of conscience as one, and Christians (and Muslims) have inherited this insight. The Jews’ claim to be God’s chosen people interprets the insight in the humblest possible way: as divine revelation, not human cleverness. But once revealed, the claim can be seen to be utterly logical. To sum up the argument most simply and essentially, conscience has absolute, exceptionless, binding moral authority over us, demanding unqualified obedience. But only a perfectly good, righteous divine will has this authority and a right to absolute, exceptionless obedience. Therefore conscience is the voice of the will of God. 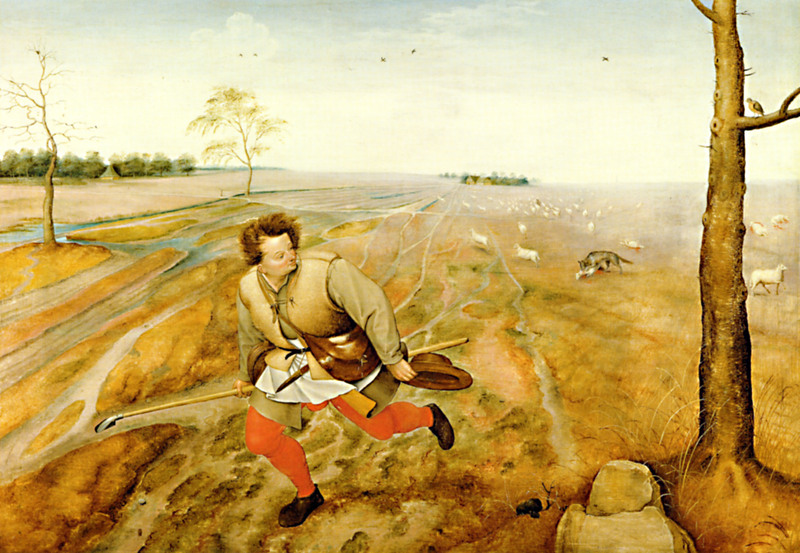 “The prophets inveighed against those wicked shepherds “who destroy and scatter the flock of [the Lord’s] pasture” (Jer. 23:1). Such shepherds failed to care for the sheep who “were scattered for lack of a shepherd, and became food for all the wild beasts…No one looked after them” (Ez. 34:5-6). The sheep who follow such shepherds find themselves lost and perishing. who have others at their beck and call. “O Lord, You are my Shepherd, I shall not want; You make me lie down in green pastures, You lead me to the water of refreshment, You convert my soul and lead me on the paths of justice. Even though I walk in the ravines, in the dark valleys, I shall fear no evil, for You are with me. Your rod and Your staff are my comfort. You prepare a table before me in the presence of my enemies. You anoint my head with oil, my cup runs over” (cf. Psalm 23). O Lord, my Good Shepherd, what more could You have done for me that You have not done? What could You have given to me that You have not given? You willed to be my food and drink. What more delightful and salutary, nourishing and strengthening pasture could You have found than Your own Body and Blood? O good Lord Jesus Christ, my sweet Shepherd, what return shall I make to You for all that You have given me? What shall I give You in exchange for Your gift of Yourself to me? Even if I could give myself to You a thousand times, it would still be nothing, since I am nothing in comparison with You. You, so great, have loved me so much and so gratuitously, I who am so small, so wicked and ungrateful! I know, O Lord, that Your love tends toward the immense, the infinite, because You are immense and infinite. Please tell me, O Lord, how I ought to love You. My love, O Lord, is not gratuitous, it is owed to You…. Although I cannot love You as much as I should, You accept my weak love. I can love You more when You condescend to increase my virtue, but I can never give You what You deserve. Give me then, Your most ardent love by which, with Your grace, I shall love You, please You, serve You, and fulfill Your commands. May I never be separated from You, either in time or in eternity, but abide, united to You in love, forever and ever.” (-Ven. R. Jourdain). The roots of these conflicts are not hard to find. St. Paul took up the relationship of law and grace in his letters to the Romans and the Galatians. The apostles and elders treated the question definitively in the first Church council, described in Acts 15. In these sacred texts, we read about the struggle between Hebrew Christians who adhered to the law and Gentiles who came to Christ without the Mosaic Law. 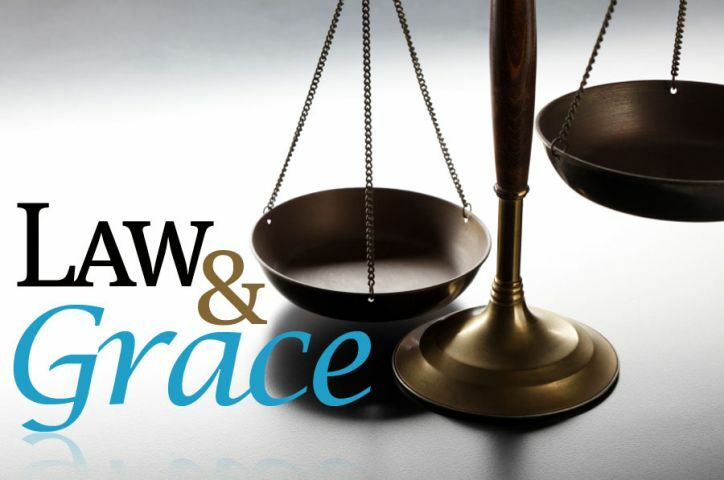 The record of this episode in Scripture guarantees that law and grace will always be a part of the Christian’s theological lexicon. The first Christian conflicts over law and grace took place in a context far removed from subsequent Church history. The first disciples were mostly Jews from Galilee and Judea. Hellenic Jews from the diaspora quickly joined their ranks, and early Gentile converts came from among the proselytes to Judaism. (The Gentile “God fearers” were those who accepted Jewish belief but did not submit to circumcision or practice the full range of Jewish law.) St. Paul preached mostly in synagogues to Jews and to “God fearing” Gentiles. From context, it is plain that Paul has in mind The Law of Commandments and Ordinances that had created a barrier between Jew and Gentile. In other words, Christ destroyed the Mosaic Law in order to reconcile Jew and Gentile through faith. Where does grace fit into the picture? For St. Paul, the Mosaic Law cannot compel true righteousness. It can prescribe and enforce external ritual and behavior, but law alone does not change the human heart. Real righteousness is a matter of love – the love of God and neighbor (Romans 13:8) – and not simply following a list of ritual prescriptions. And where does love come from? It is the gift of grace. Christ lays down His life for us. We grasp that through faith. With the help of the Holy Spirit, it elicits our loving response.